Here it is, yet again, another blog starting out with "I know it's been a while". Well, you're right; it has been a while. There are no excuses, it is what it is. But here we are, so let's talk about the course. Thankfully, the system was only tested for a few weeks this year. Undoubtedly we had our share of issues, and issues that we are still dealing with. The pumphouse has been temperamental, and is on the docket for some much needed attention. I was very thankful this season to have the help of a very talented young man, in Steven Ganter. Although we could only squeeze a few days out of him this summer, he certainly left an impact and aided us in the repairs of the numerous electrical, and rotor issues that we experienced. I am also very happy to say, that another former staffer Claude Cormier, has returned as well, to aid us in this battle. The electrical issues that we encountered this season with the system as a whole were overwhelming at times, but with the help of these two gentlemen, I am confident we will have the system up and running in no time. We have slated the winterization of the irrigation system to begin on the 20th of October. Please keep this in mind if you are planning to play on this day, as it can get quite loud (and wet) out there. The past 3 weeks has seen a war on weeds take place in the fescue and rough here at the course. There were areas of the property that were absolutely overrun with undesirable plants, and had quite frankly become unplayable. With the weather of the past few weeks being primarily dry, and warm, it was the perfect time to hit them hard. We were able to cover about 80% of the total fescue and rough area of the course, and I am thrilled with how effective these applications were. We should see a drastic change to the weed population for next season. Oh that dreaded aerator. We have kept the aerator fairly busy in the past month. Of course you know that we had completed the greens aeration in late August, as well as the tees. Since this time we have also competed all of the par three approaches, and have knocked off a handful of fairways. In regards to the fairway aeration, this has been a process that is incredibly long overdue. It is a very time consuming, difficult task to complete, but is greatly needed. Some of these clay packed fairways are putting up a bit of a fight, causing us some mechanical issues, but we will get through it. I am hopeful that this is a yearly task we can continue to undertake, to promote the long term health of our fairways. With the arrival of October, and the exodus of the bulk of our turf crew, we have reassigned the remaining crew to these end of year priority tasks. 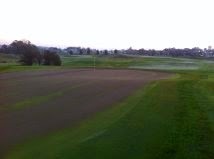 Items such as aeration, and topdressing, and general winterization will take precedence over some golf course setup tasks such as bunkers, so you will notice that we are not as quick to get around with the trap rake. We will continue to prepare the course for the winter over the coming weeks. Fairway aeration will continue, as will many areas of rough. I am quite happy with the progress we have made this summer, and am confident that moving into next year we will continue to make great gains.